When I was growing up, we didn’t have the internet. We learned from mentors or read books. Unfortunately, most of us didn’t have influential mentors or people who shared valuable life-changing advice. I love learning from people who have lived a full life so that we can learn from them and not repeat mistakes. When I was growing up, I wish that I had Skip Prichard’s new book The Book of Mistakes in my hands. It would have saved me grief and making mistakes that were painful to endure. I would love to arm every young person with Skip’s book. It’s a valuable bible on how to achieve and not only be a better person but efficiently empower others. The Book of Mistakes is a parable. We join David, a stressed and disenchanted young professional, on his journey to discover the nine mistakes that prevent people from achieving their goals. He meets mysterious people who share their stories, and each one offers him a parting life mistake to learn from in the hope of him avoiding the same mistake. Absorbing these mistake are critical for any of us to overcome hurdles that we face and distractions that veer us off of our path. The Book of Mistakes made me pause and think about the journey that I have been on over the years. For years I searched for my purpose, and Skip’s words would have guided me in finding and following my mission. It would have helped me push down barriers more quickly. I would have had a clearer mind to achieve more than I thought possible. Guess what? It’s not too late. The Book of Mistakes recommends steps to consider on our life journey to be happier, more satisfied, have a stronger sense of community, and be at peace. The nine mistakes impacted me. I have a list of the nine mistakes on a sign at my desk and on my IPad screen to remind me several times how I can stay on the path that will bring me success. These mistakes should be posted in every classroom to guide young adults as they waver through growing up and become absorbed by obstacles and the negative talk around them. Working on someone else’s’ dream. Aren’t many of us doing that day in and day out? Don’t forget YOU and your goals. Set aside time to work on what you believe in and are passionate about. Accepting excuses: Take ownership of your life and don’t allow excuses to rule the day. Behind every excuse is a way to success so tune them out and tune out any doubts. Surround yourself with the wrong people. When you were growing up, how many times did your parents tell you to not hang out with the wrong crowd? That remains sound advice as adults. You become what you are around. Staying in your comfort zone. You will never grow if you don’t jump out of your bubble. Trying to blend in instead of standing out. Be authentic and be you. Always stand out and above. Thinking there is a fixed and limited amount of success available. The beautiful thing about life is that there is an unlimited possibility. Be motivated, not intimidated by the success of others. There is plenty to go around. Believing you have all the time in the world. We are all given the time in life. Use it wisely and don’t have regrets. We learn more than just the nine mistakes in The Book of Mistakes. We learn some simple, yet often forgotten, laws that should guide us in everything that we do. If you have young people in your life, you need to get The Book of Mistakes into their hands. Today. If you are older and wiser, you need Skip’s book to light a fire within you so that you quit making excuses and making the same mistakes in your life over and over. It’ never too late to start again to bring out your best and find personal success. Becoming a leader is like parenting. Sometimes it’s a surprise, other times it seems like you’ve been waiting for the opportunity forever. You are thrust into a whole new world, and there isn’t a day that goes by that you don’t wonder if you are “doing it right” or being an active parent. You look inside and out to learn how to be the best that you can while influencing your child. Leadership leaves many of us feeling inadequate and looking over our shoulder wondering if we are “doing it the right way”. I’ve worked with servant leaders who lead from within with grace and humbleness and “leaders” who think yelling and threatening is leadership because people quickly respond and fall in line. Ultimately what drives authentic leadership is courage. Courage will compel you to look deep inside yourself to bring out your best with integrity and it will drive you to impact those around you. Courage is more than just stepping up. It means living your life becoming “your best self and inviting others to do the same”. Need some courage? 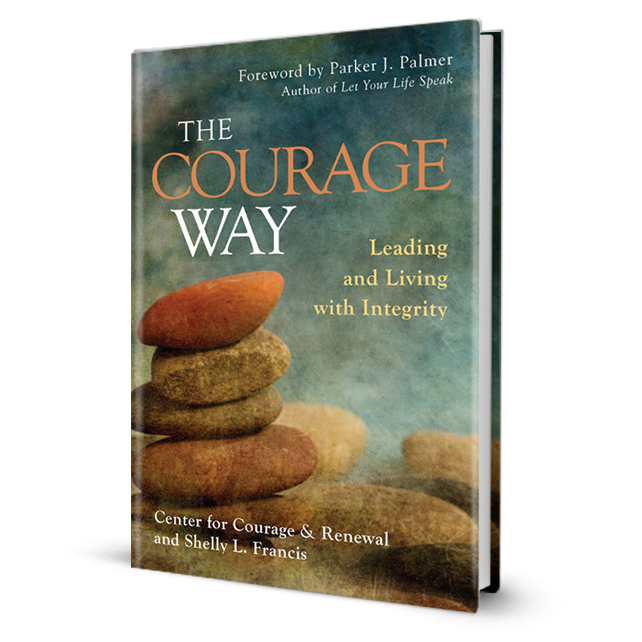 Shelly L. Francis’s new book The Courage Way – Leading and Living with Integrity will take you on an incredible journey. Shelly Francis works at the non-profit Center for Courage & Renewal. The center has over 300 facilitators worldwide who aim to create “a more just, compassionate, and healthy world by nurturing personal and professional integrity and the courage to act on it”. Shelly walks us down the path of showing us the courage way and forcing us to look deep inside to understand the work of being a leader and bringing out the courage to live the leadership ways. We need to ask ourselves “what would you do with more courage?” and act on it. These elements enable us to become what we can be. Courage isn’t a singular “thing”. It can take many forms such as courage to answer your calling, the courage to choose wisely, the courage to stay or leave, or the courage to care for true self. Some courage is more natural for us to summon while others may be daunting. There is more to courage than just the discovery process. In order to flourish, we need to live in a Circle of Trust. What’s that? It’s a process to create and grow a safe space for both individuals and groups so that they can trust one another to develop growth, restoration, team building, and reconnect. Within this circle there are 11 touchstones. Ultimately, Shelly emphasizes the need to take care of ourselves and regularly reflect. To be an active leader you need to trust in yourself and others. You need various forms of courage to develop people, build trust, and form a healthy community. With courage comes authentic and natural leadership that grows over time and only brings out more courage to step out of your comfort zone. The Courage Way shares real-life stories of professionals who have made changes in their leadership because they have found inner courage and it has impacted both their lives and those around them. The Courage Way is a unique leadership book that will remove you from your comfort zone and force you to look at yourself with a fresh perspective that may bring out courage that you never realized you possessed. The question is, do you have the courage to look at leadership from a different angle and start living a life of integrity and authenticity?